The Forum was filled with 160 guests for ACC's Taste of Asia dinner. Photo by Kyle Parks. 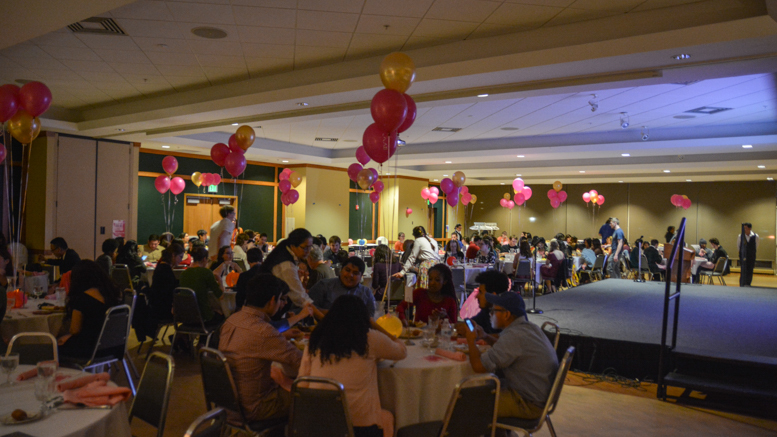 The Forum bustled as students, faculty, staff, and the community alike gathered for the Asian Community Coalition’s annual “Taste of Asia” dinner on Feb. 23. According to Tonae’ Hamilton, the President of ACC, the dinner sold out, reaching the 160 guests that the organization had planned for. 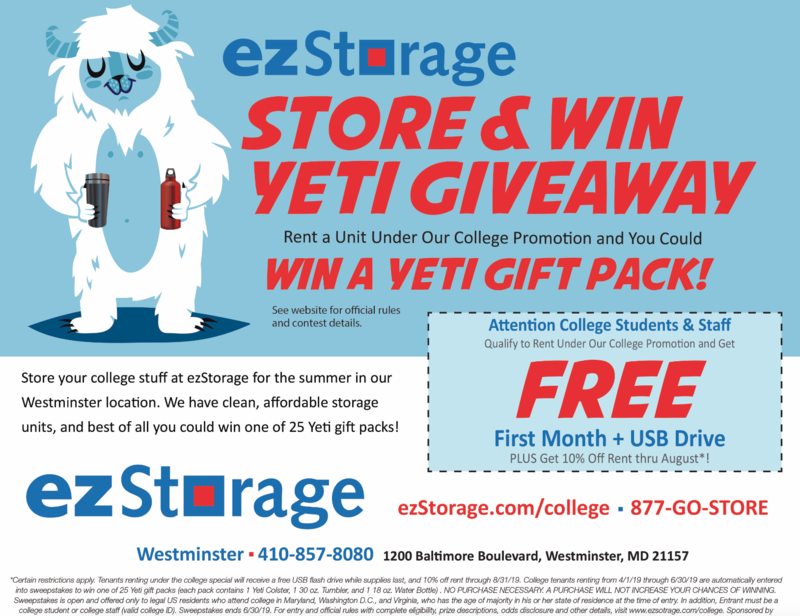 ACC had been planning the event since just after Jan Term. 10 percent of the proceeds of this event went to the Araminta Freedom Initiative, an organization seeking to end human trafficking in the Baltimore region. At the end of the evening, after a video outlining Araminta’s mission, ACC formally presented the funds and read a message from the director of Araminta. After a brief introductory video, produced by Jabraan ‘14 and Kamran Ismail, attendees were treated to a vibrant sampling of Asian cuisine. Among these were Singaporean mee siam, Chinese salad, Vietnamese spring rolls, and Dakgangjeong, a Korean chicken dish. Guests were entertained by Phuc Truong and Tonae’ Hamilton, who served as the emcees of the event. In addition to introducing each performance, they made a variety of jokes that kept the audience laughing and engaged the entire evening. In opening, Truong highlighted the strong history of the Taste of Asia dinner, which, according to Hamilton, has spanned over a decade now. On this year’s theme, “Festival,” Hamilton explains, “We wanted to go back to the whole ‘traditional’ aspect of it. Last year we did more of a modern twist, so we wanted to go back to our roots.” Last year, ACC’s dinner included a more contemporary theme, being modeled after Saturday Night Live. Festivals, however, constitute a significant part of Asian culture, says Hamilton. 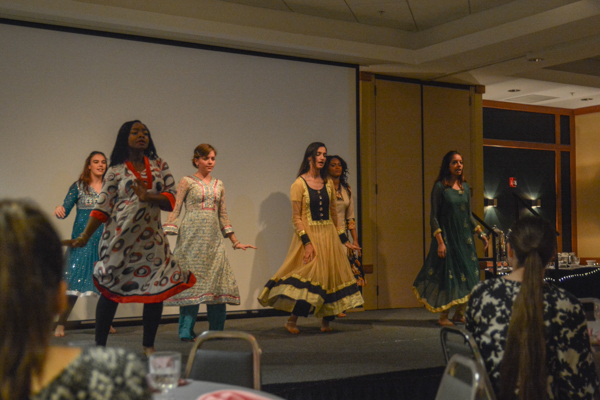 Upon the conclusion of the dinner portion of the event, guests were then treated to a wide array of performances, ranging from dances, music, skits, trivia, and even a fashion show. First up was a fan dance to “The Noon Dream” by Thuy Chi, choreographed by Angel Tuong. This was followed by a cover of “Where Do We Go,” a song by Tata Young and Thanh Bui, performed by Hoang Edullantes and Thao Tran. 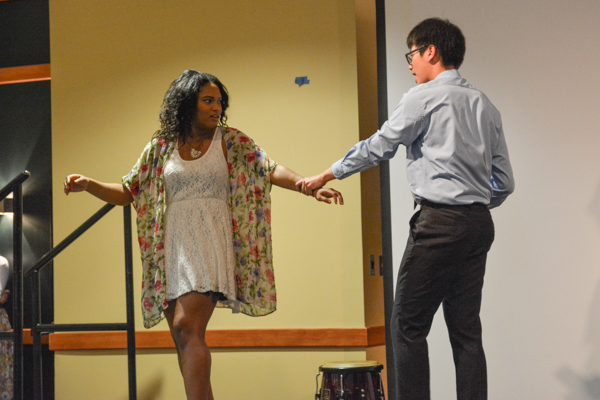 The audience then watched “ACC’s Got Talent: Festival Edition,” which featured several satirical dance performances before a panel of judges. In the end, two performers took control of the show and performed “Gangnam Style” against the wishes of the judges. Afterwards, guests watched another dance performance, this time by the Aaja Nachle Bollywood Dance Club. The club danced to “Nagada Sang Dhol” from the movie “Ram Leela” (2013). After all of this energy, a trivia activity pitted tables against each other with general knowledge questions relating to festivals. Following this, a mashup of “Whistle” by BlackPink and “Half Moon” by Dean was performed by Jacqueline Yarwaye and Navagaye Simpson. 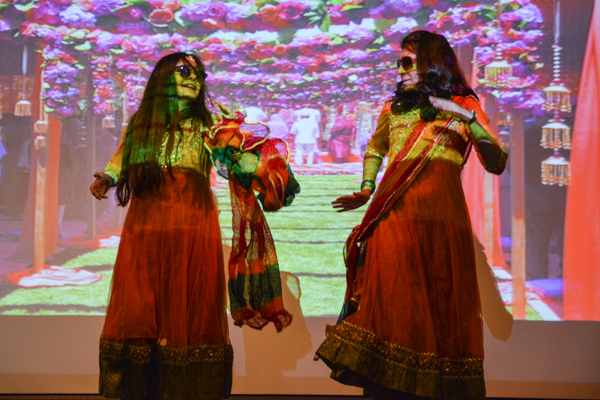 Another mashup followed, this time themed to Bollywood dancing, performed by Lamia Rhymee and Michelle Mahmood. The McDaniel Belly Dance Club then gave guests another dance performance, first dancing to “Drum Solo” by Super Saidi, then to “Storm” by Yoshida Brothers. 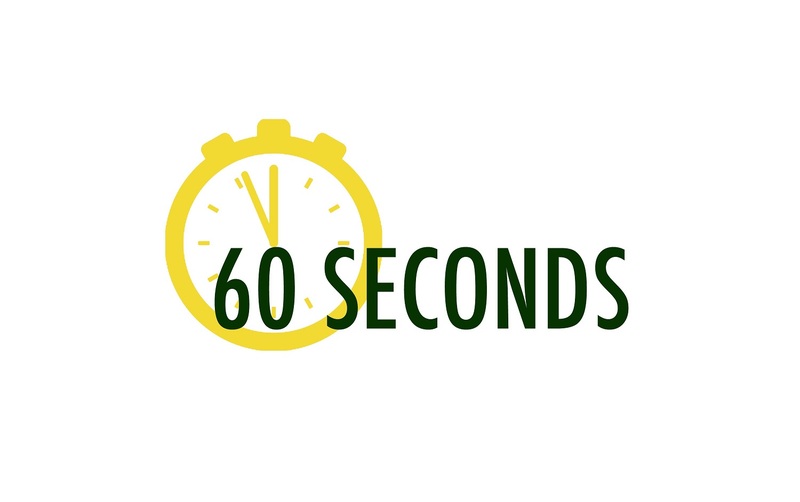 A skit, written by Jacqueline Yarwaye, titled “Love at the Festival,” introduced viewers to a variety of Korean expressions and dramatic clichés in Korean dramas, in addition to entertaining them. 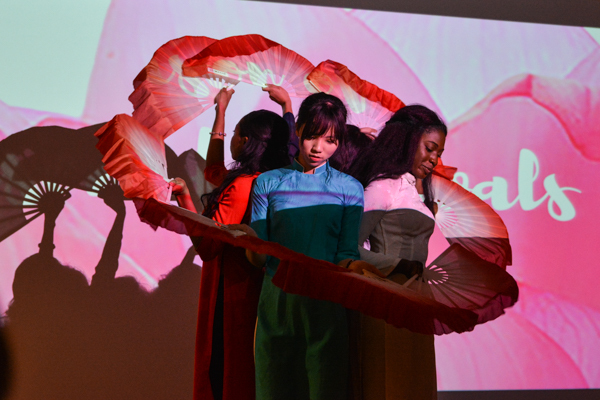 Members of multiple organizations then participated in a fashion show, which featured a variety of traditional dress from Japan, Korea, India, and Vietnam. All of those in attendance were then welcomed to participate in a dance to “Discowale Khisko” from “Dil Bole Hadippa” (2009). 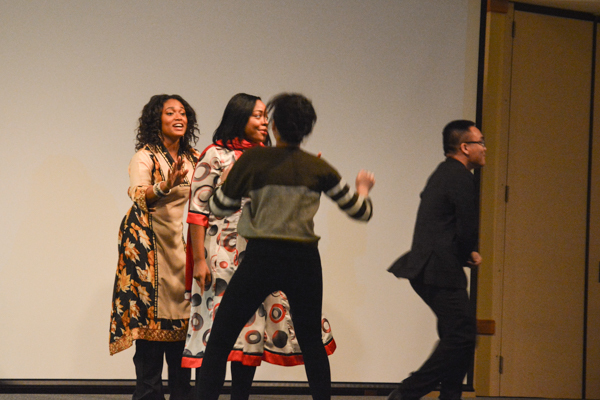 Members of several organizations and guests alike danced on the stage at the front of the room. 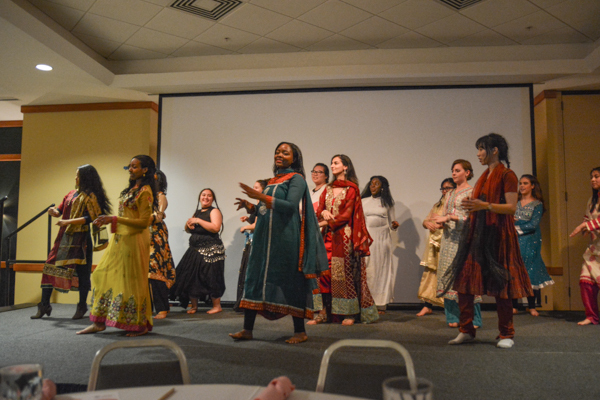 Members of various organizations dancing as a group to “Discowale Khisko.” Photo by Kyle Parks. 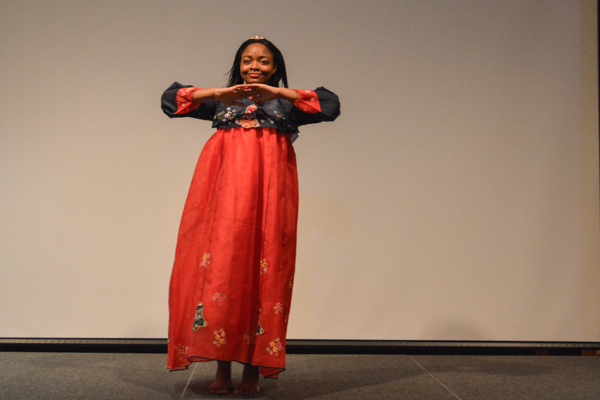 Jacqueline Yarwaye modeling traditional attire during the fashion show. Photo by Kyle Parks. 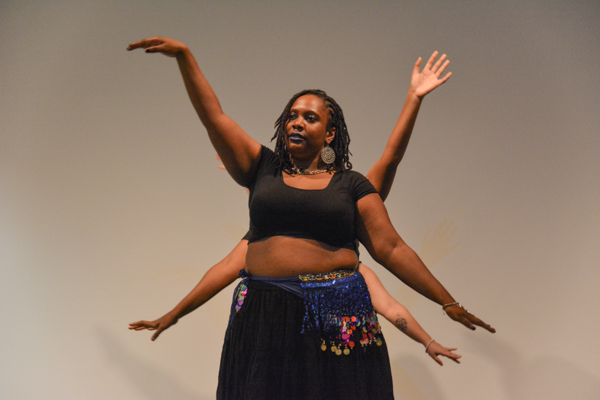 The McDaniel Belly Dance Club dancing to “Storm.” Photo by Kyle Parks. The Aaja Nachle Bollywood Dance Club dancing to “Nagada Sang Dhol.” Photo by Kyle Parks. 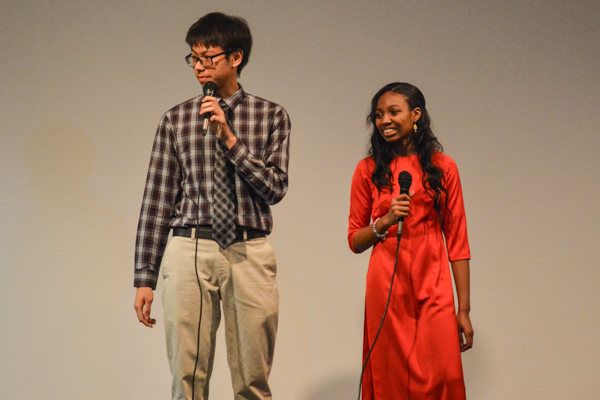 Navagaye Simpson and Phuc Truong displaying a cliché in Korean dramas in a skit. Photo by Kyle Parks. Michelle Mahmood and Lamia Rhymee performing a Bollywood mashup. Photo by Kyle Parks. Contestants on “ACC’s Got Talent” take the stage while judges try to subdue them. Photo by Kyle Parks. Phuc Truong and Tonae’ Hamilton spoke in between performances. Photo by Kyle Parks. 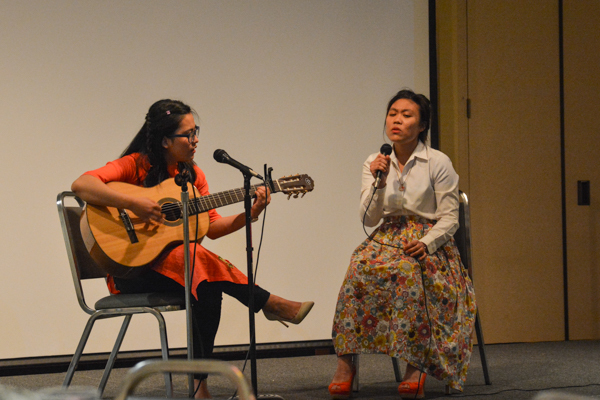 Thao Tran and Hoang Edullantes performing “Where Do We Go” by Tata Young and Thanh Bui. Photo by Kyle Parks. Dancers making a formation during a fan dance. Photo by Kyle Parks.